Students will learn to discriminate between words that begin with the same beginning sounds and those that with different beginning sounds. Students will indicate awareness of same and different beginning sounds by responding with a physical movement. Phonemic awareness, a critical pre-reading skill, includes three abilities: discrimination, isolation, and manipulation of sounds in words. For example, students can discriminate that the words cat, call, and coffee all begin with the same sound, whereas the word dog begins with a different sound. If students can isolate sounds, they can state that the words cat, call, and coffee all begin with the sound /k/; whereas the word dog begins with the sound /d/. If students can manipulate sounds. 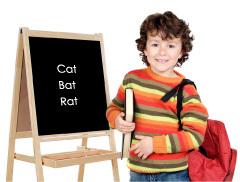 they can replace the first sound in the word cat with other sounds, producing the words rat, sat, hat, etc. Students must learn to discriminate sounds that are alike and different before they can move on to isolating and manipulating sounds. The song, Words in My Pocket, in this lesson gives students plenty of practice in discriminating one word in each group that begins with a different sound from the others. The auditory discrimination that students develop in preschool years or kindergarten prepares them for decoding and spelling words through phonics. This lesson plan uses music, rhythm, and play activities to encourage students to listen, practice, discover, and create words and phrases with the same and different beginning sounds. Each time a beginning sound is discovered to be different from the group, students respond physically, reinforcing the concept by including more of the total body in the learning experience. The imaginative and silly things found in the illustrated pockets in the song, Words in My Pocket have great appeal to students, giving them the feeling that they are playing, rather than learning. It should be stressed that, at this stage of development, discriminating beginning sounds is an auditory skill, rather than a visual one. In other words, students recognize same and different beginning sounds when they hear them but do not generally have the skill level to read or spell the words in the song. However, for students who already recognize some letters and sounds, song lyrics on the Mini-Charts can help build skills in spelling and reading simple words beginning with same and different consonants. This lesson is the third in a series of five lessons. The previous lesson, Kindergarten Phonics Phonemic Awareness: Consonants, teaches students to recognize groups of words with the same beginning sounds sound. The next lesson in the series, Kindergarten Phonics Phonemic Awareness: Sounding Out Words, teaches students to separate words between onset and rime and to blend onset and rime into whole words. Optional: picture cards and/or objects beginning with any of the following letters- b (ex. book, ball, bell, balloon, belt, bear, bee, bird), c or k (ex. cup, crayon, carrot, clay, cat, kitten, kangaroo), d (ex. doll, dime, dish, dirt, diaper, duck, dog, dragon, dinosaur), f (ex. feather, fan, flashlight, fish, flower, fork, fox, fly, fish), g (ex. glue, glass, glove, grapes, grasshopper, gorilla, goat), h (ex. heart, hammer, helicopter, helmet, honey, hook, horn, hen, horse, hippo), j (ex. juice, jelly, jam, jack-o-lantern, jacks, jaguar, jellyfish), l (ex. leaf, lemon, lamp, lace, lid, lettuce, lion, lamb, ladybug), m (ex. milk, mitten, mask, magnet, marble, mirror, mouse, monkey), n (ex. nail, napkin, nickel, newspaper, nut, nuthatch, newt), p (ex. pencil, pen, paper, penny, popcorn, potato, pumpkin, penguin, pig), r (ex. rice, rope, ring, rock, ruler, rabbit, reindeer, rat, raccoon), s (ex. star, salt, sock, spoon, scissors, seal, spider, squirrel), t (ex. toothbrush, truck, tape, towel, top, turkey, tiger, turtle), w (ex. water, watch, whistle, watermelon, wagon, wheel, wire, worm, whale, woodpecker). Note: If you do not have the CD or Mini-Charts, you can still teach this same and different sounds lesson plan using the folk tune listed on Phonemic Awareness song Words in My Pocket Song Lyrics page. For this level, it is good practice to include pictures, for visual reinforcement. Place four objects or picture cards on the table. Three of these should begin with the same sound and one should begin with a different sound. Ex. book, ball, bell, toothbrush. Ask students to group the objects together that have the same beginning sounds. Name each object slowly and clearly. See if any students can identify the beginning sounds as /b/ and /t/. Repeat this process with other objects listed in the Materials section above. Turn to Mini-Chart page 42. Ask students to name the things in each pocket and identify the one object that begins with a different sound. Play CD Track 5 again and ask students to sing along, This time, allow students to point to the appropriate pictures on the Mini-Charts and have students lead in the clapping, stomping, or knocking movements as they identify the words with the different beginning sound. Practice singing Words in My Pocket every day for a week. Then try singing the song with the instrumental track on the CD (Track 6). Do the students remember all the words to the song? Review any parts of the song that are giving them difficulty and use the pictures on the Min-Charts to aid memory. If the words of the song are well-remembered, ask the students to come up with other movements besides clapping, stomping, and knocking to show that they know the words with different beginning sounds. Ex. slapping thighs, jumping, bending, thumbs up, standing/sitting, stepping forward/backward, etc. Help students create other sets of words for the song. Make 5 copies of Mini-Chart template pp. 82-83 and pp. 84-85. Help students come up with new words for the blanks. On pages 82 and 84, decide on the body movements you want to do. On pages 83 and 85, decide on three or four objects to put in the pocket. All but one of the objects must begin with the same sound. See the Materials list above for suggestions. You do not need to replace all of the verses. Allow students to illustrate the new lyrics in the pockets on the Mini-Chart template. Place pages with new words in a 3-ring binder in page protectors and sing with the instrumental track on the CD (Track 6). If you have not replaced all the verses, sing the original verses on the parts of the song that do not have new examples. Play a sorting game with picture cards as suggested in the Materials list above or add your own picture card ideas. Have students sort pictures by beginning sounds. For example, pictures of boy, ball, book, and beans go in one pile. Pictures of lion, leaf, lock, and lemon go in another pile. Try this activity at first with only two different beginning sounds. When students have mastered this level, try the activity using pictures with three different beginning sounds. You can also have students sort these cards into piles for 1) begins with /b/ and 2) does not begin with /b/. Students who know some of their letters and sounds can help spell or write words with beginning sounds that they create for the song. Students indicate initial conconant discrimination by making appropriate movements on the words in the song with different beginning sounds, without assistance.